Discussion in 'More Accessories' started by beauxgoris, Dec 6, 2009. Since Ray-Ban and a few others have their own thread I was hoping we could talk about classic Persol sunglasses. 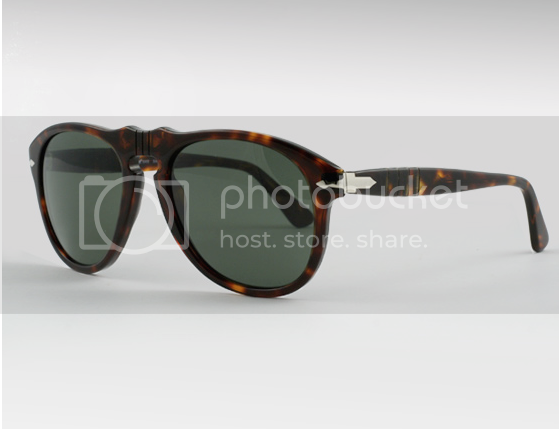 "The persol 649S, created in 1957, became instant legend when Marcello Mastroianni wore them in the Pietro Germi film "Divorce Italian style". A favorite of Steve Mcqueen’s both on and off the screen. 1994's French book "qualita: scenes d'objects a l'italienne" declared it one of the objects most representative of the Italian genius of yesterday and today. " 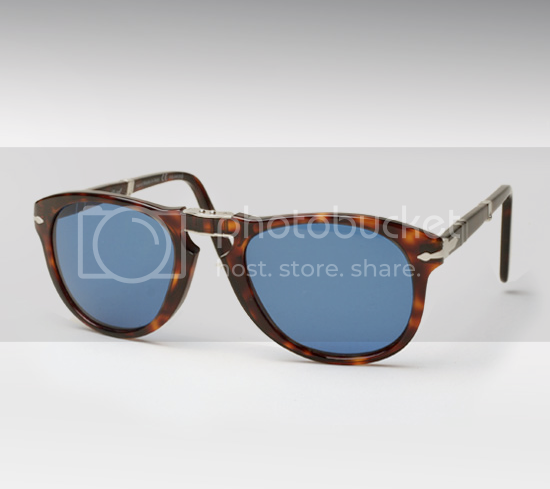 "Persol Model 649s, designed for tram drivers in Turin who needed large glasses to protect their eyes against wind and dust, first hit the stores in 1957. The uniqueness of the 649 design made it an instant success, and many knock-offs were created by Persol's competitors. Persol, founded in the early 1920s, started out making aviator glasses for the Italian Air Force and racing googles for the legendary Italian driver Fangio. In 1961 Persols became iconic when Marcello Mastroianni wore them in the film "Divorce Italian Style." 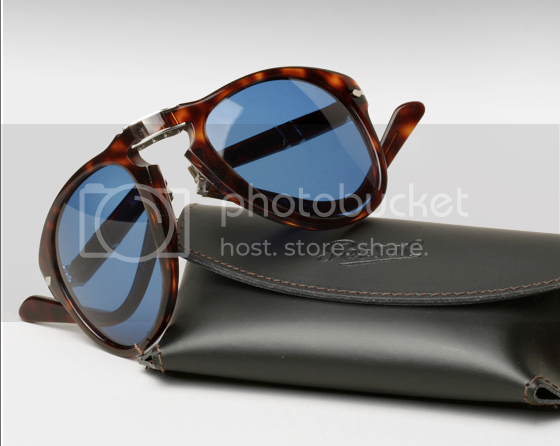 The 649's lenses are made of real crystal and have the Persol trademark arrowhead etchings in the corners. The collapsible frames also sport the patented "Meflecto" joints, Meflecto GTOs to be precise. The particular Persols McQueen wore in that ultracool crime caper "The Thomas Crown Affair" were actually customs, with icy blue lenses, made by Hollywood eyeglass designer Dennis Roberts. Roberts, the owner of Optique Boutique, made 800 (not a typo!) pairs of sunglasses for McQueen alone in his lifetime, many of them riffs on the popular Persols. He also created outlandish eyeware for Elton John, Elvis Presley (including the famous TCB glasses), one-eyed Black Rat Packer Sammy Davis, Jr., Jimi Hendrix, Liberace, Peter Sellers, Bobby Darin, Cary Grant, Jim Morrison, and John Belushi (the yellow-tinted "Bees"), among others. If you run across a pair of 649s in your own attempts to be like Steve, check for the word "Ratti" on the temples — this identifies the original factory at which Persol used to manufacture their sunglasses, and is an indicator that you have your hands on an "original" — made before Persol was sold to mass manufacturer Luxottica. Only on the older, true vintage pieces, will you find the words "Ratti" inscribed on the stems." 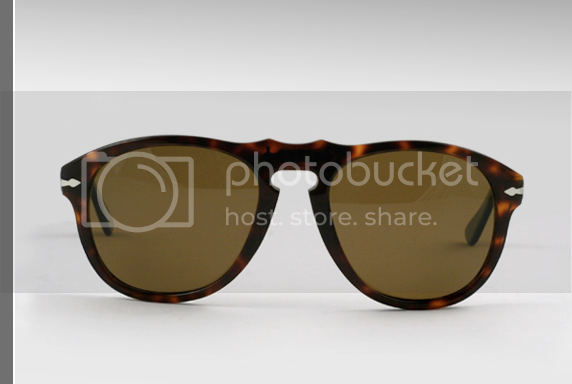 I've always wanted a pair of tortoiseshell Persols, but they are too narrow for my face. Thefrenchy - thank you for posting a photo. Those look fantastic on you! What size are your glasses? 54 or 52? p.s. I wear Ray-Ban wayfarers in the "54" size - I'm just worried that these might look too big on me in that size. However the smaller version on Michelle Williams (above) look too small for my giant head..... Just not sure. I wonder why they look so tiny on Michelle Williams? I love these glasses, but they keep sliding down my nose. I wonder if there's anything I can do to correct this? ugh - I'm so bummed I can't keep these on the bridge of my nose (I have a tiny nose and the bridge area on these glasses is quite thick/heavy). Any suggestions? Someone mentioned going to a eyeglass store and having them bend the arms so they curve behind my ears more - but I'm worried it will pinch and give me headaches. Hi, I'm new to this thread. I tried on style 2869 today but keep seeing that the 0714's pop up alot. Can anyone tell me the difference as I'd have to order those. Also does anyone know which style Michelle Williams has. Seems to be a bit of a mind field in terms of col lens etc. In need a Persol expert to guide me. She was the 649 in the 49mm size. The 714's are the same glasses as the 649 only with frame folds up. Thank you, I think I'm going to go for the 649. Have found a website that has them for £98. You say she has 49mm, I've only seen 52 or 54. PS any idea which col lenses she has, there seems to be about 3 different black ones. Did you change from 714 to 0649? 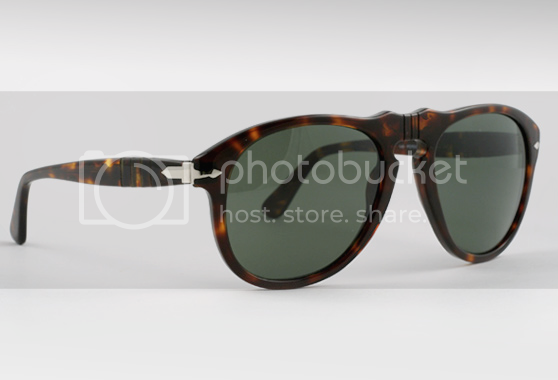 the tortoiseshell are lovely but I currently have some Oliver Peoples ones in the same colour so feel I should change.